Washington, D.C.—Sierra Club today unveiled the results of a new online effort demonstrating public support for the California Clean Car (Pavley) standards in conjunction with its testimony at a crucial Environmental Protection Agency hearing on the issue being held today. The hearing is part of the Obama Administration's review of the previous administration's unlawful denial of the Clean Air Act waiver that California needs to move forward with its clean car standards. In addition, Sierra Club launched a virtual clean car show. "People across the country want EPA to know that they strongly support the right of California and other states to move forward with their efforts to dramatically lower the global warming emissions from our vehicles," said Ann Mesnikoff, Director of Sierra Club's Green Transportation Campaign. "Most of these concerned citizens couldn't be at today's hearing so we're delighted to bring their message to EPA virtually. President Obama and his administration, including EPA Administrator Lisa Jackson, have already demonstrated strong leadership on so many key issues and we are grateful that they are so eager to hear from the public on the California waiver issue." In testimony at today's hearing, Sierra Club presented a photo petition from more than 1,000 Sierra Club members, student activists, and other concerned citizens from across the country who could not attend today's hearing in person. Each photo in the petition shows someone holding their own car keys to underscore the message that "EPA Holds the Key to Clean Cars." 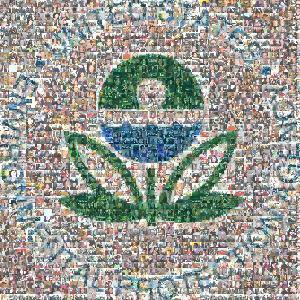 The individual images were then transformed into two photomosaics, including one depicting EPA's logo. In addition to today's unique effort, tens of thousands of Sierra Club activists have previously submitted comments to EPA and state officials urging them to move forward with the California standards. Sierra Club has also run active campaigns pushing for adoption of the standards in several states, including Arizona, New Mexico, Florida, Minnesota, Iowa, and others. "EPA's decision on the California waiver really is the key to bringing us cleaner cars and revitalizing the American auto industry," said Mesnikoff. "Americans understand that President Obama is listening and they were eager for us to share their opinions with EPA today. These images are a vivid demonstration of how excited and engaged the public is on this and the many other issues where President Obama is moving to right the wrongs of the Bush years." "This virtual clean car show demonstrates that automakers already have the technology to reduce global warming emissions from our cars, trucks, and SUVs," said Jesse Prentice-Dunn, Sierra Club Green Transportation Program Associate Representative. "Even some of the biggest trucks made by American automakers already meet the standards for the current year and beyond. Implementing the California standards will not only help revitalize Detroit by making it more competitive, but will also make us more energy independent and fight global warming. Contact Josh Dorner for copies of the images above or Sierra Club's complete testimony at today's hearing.